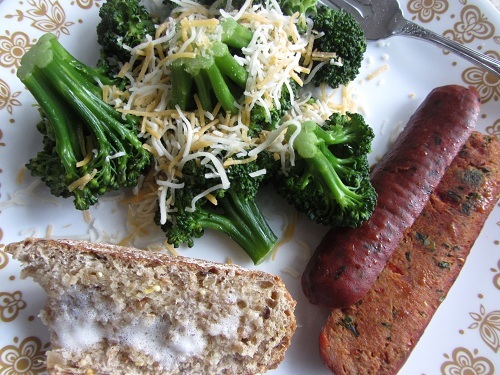 Italian sausage recipes are an excellent way to come up with a quick meal choice. 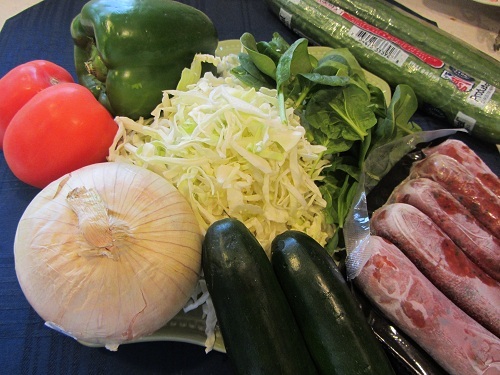 These Italian sausages are versatile and can be used alone or in combination. I always have several packages stored away in my freezer to use when I am pressed for time. My favorites come from Trader Joe’s and are chicken sausages without chemicals and they have a great zing to them. We enjoy them by themselves, in stir fries, or in spaghetti sauces where they have replaced ground beef! 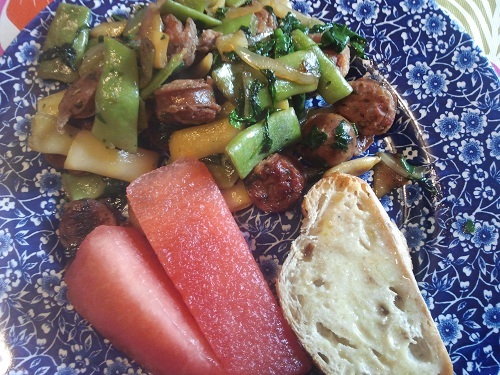 Sausage stir fry recipes are simple. If you purchase well seasoned choices, no extra sauces or seasonings will be needed. No sauce means fewer calories, which is always a healthy diet habit. Simply pair the sausages with vegetables that seem to go well and a meal is born with a few minutes of vegetable preparation. 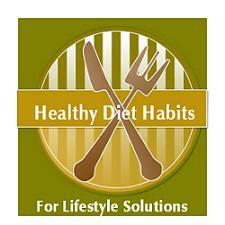 Healthy fast food at your fingertips! Everyone needs a few of these simple recipes to avoid the call of fast food which is an unhealthy diet habit to engage in! I thaw them a bit and slice them partially frozen into small slices. They are much easier to slice this way. I stir fry them in a large stainless steel skillet and then remove them to a platter, while I quickly stir fry vegetables to add with them. Then I return them back to the pan and heat the mix through and a quick meal is ready to go. I sometimes pair the meal with a grain like whole wheat couscous or cook pasta separately and add it into the skillet and stir fry it in. 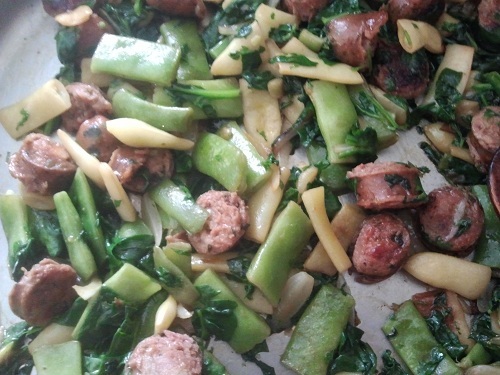 Slice and stir fry the sausages and garlic until nicely browned and remove them to a platter. 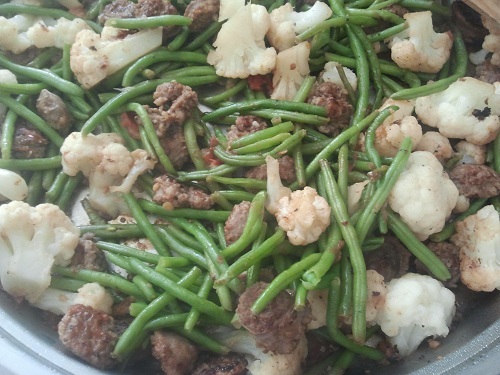 Stir fry the cauliflower in a small amount of water until they are crisp tender. I often cover them so they steam. Remove to platter. Stir fry the green beans in a small amount of water and cover them and cook until done. Add the other ingredients back in and top and heat through and top with chopped fresh basil to serve. Slice and stir fry the sausages and onions until nicely browned and remove them to a platter. Stir fry the Romano beans in a bit of water until they are still crispy. Add the kale in and continue to stir fry for just a couple of minutes. Add the sausages back in and heat through. 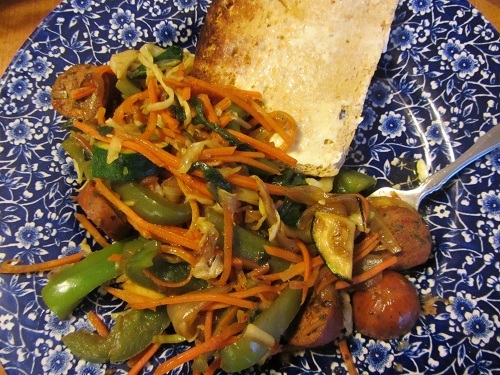 I wanted to show two similar Italian Sausage Recipes with differing vegetables, but each cooked the exact same way. Over time you will figure out the vegetable combinations that you just love, or learn to use stir fries as a way to clean out your refrigerator before your weekly shopping trip! 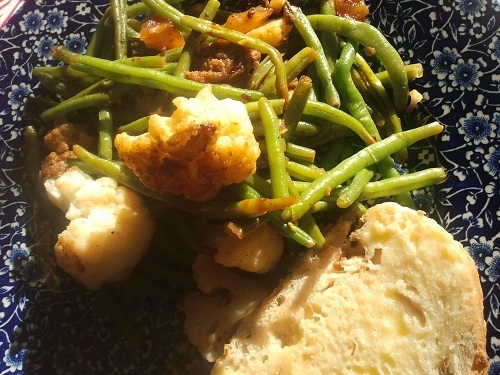 That is my lifestyle solution on how to avoid wasting vegetables and thus saving money!